Yeah, I still call it radio, even though many of these pieces are podcasts. 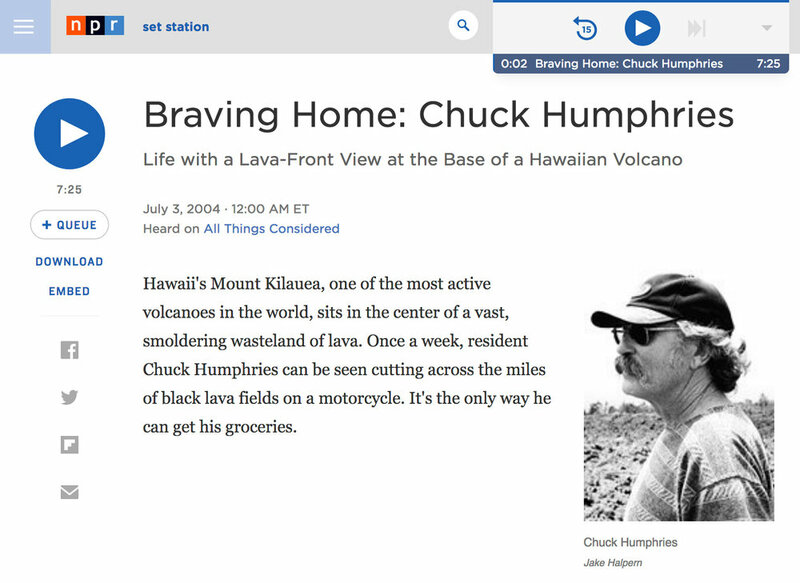 I started producing radio for NPR before podcasts existed, which makes me, well… old. Listen to some of my work. I suggest that you start with “Switched at Birth” from This American Life. It’s long. Like an hour. So save it for a long drive. THE COLLECTOR on This American Life: Jake tells the story of a rare documents expert, John Reznikoff, who came into possession of some materials which—if authentic—would change history. Then things got complicated. Scroll down, it's the second act (32 minutes). THE NEW UNDERGROUND RAILROAD on The New Yorker Radio Hour: The tale of a secret house in Bufffalo, N.Y., and the people who are risking their lives to get there. Listen on the New Yorker Radio Hour. NAZI GOLD on The New Yorker: While I was in Poland, reporting my "Nazi Underground" story for the New Yorker, I also made a 20-minute radio documentary. Listen here. THE BUFFALO TALK OFF on Planet Money: A journey into the world of debt collecting. Click here to listen. SURVIVING EBOLA on Snap Judgment: My new NPR story on a mom who made her own Ebola suit -- MacGyver style -- and saved her son's life. WHAT ABOUT DAD? on Snap Judgment: What happens when you dad dissapears for 30 years and then suddenly needs your help? A BOY'S HEART on All Things Considered: Listen to the story of a young, aspiring Navy Seal who died and the man who got his heart. This story took me six months to report. SHRAPNEL on Snap Judgment: When the fight is over we still have to deal with the pieces of the battle that remain inside. This is the story of one Marine's struggle. LIFE ON AN ERUPTING VOLCANO on All Things Considered: It's just a little lava. THE UNDERWATER TOWN on All Things Considered: What happens when your town becomes a modern-day Atlantis? Have a listen. TOWER OF THE ARCTIC on All Things Considered An abandoned military base becomes a refuge for eccentric loners. THE LAST OF THE MALIBU HILLBILLIES on All Things Considered: Millie Decker never runs from a raging inferno. ISLAND OF THE STORM RIDERS on All Things Considered: Why run from a hurricane? Have a listen. CHRISTMAS DAY MOVIES PRESENTS… on All Things Considered: Unsure of how to fit in with my in laws, I cast them as zombies in a movie. THE HOTDOG VENDOR & THE U.S. CONSTITUTION on All Things Considered: My dad, the hotdog vendor and Constitutional law professor, takes on the NFL. MY GRANDFATHER'S TRIP TO THE MOON on All Things Considered: He never made it, but maybe I will. GRANDPA'S BIRTH on All Things Considered: The story of my grandfather's life, as told in his 107-year-old birth certificate. BED BUGS on All Things Considered: Listen to my latest commentary on bed bugs, paranoia, and a very high-priced dog named Bugsy. A CRIMINAL COINCIDENCE on All Things Considered: When you are reading a who-done-it novel, it is odd to discover that a character with your name, in your hometown, from your very own street is a suspect. URBAN LEGENDS on All Things Considered: I didn't believe it until it happened to me. NIGHT SOLDIERS on All Things Considered: Check out my review of Alan Furst's novel, Night Soldiers. ZOMBIE SURVIVAL on All Things Considered: Listen to my latest commentary on zombies, obsession, and survival. SURVIVAL BOOKS on All Things Considered: Listen to my latest commentary on three books which -- literally -- might just save your life. SHIPWRECKED on All Things Considered: Three books for the shipwreck-obsessed. THE WINDS OF WAR on All Things Considered: A book that spans generations. MAD MEN on All Things Considered: How the TV show Mad Men helped me understand a paranoid chapter from my family's past. Click here. A NEW GAME THAT'S GOOD -- TOO GOOD on All Things Considered: What happens when simulations in video games become too life like? Click here. OLD BOOTLEGS on All Things Considered: There is only one way to listen to the Grateful Dead. Click here. SIDEKICKS on All Things Considered: A tribute to Ed McMahon, Sancho Panza, and sidekicks everywhere. Click here. ROLLING OUT THE RED CARPET on All Things Considered: A story about the meaning of the Hollywood red carpets and an encounter with the guy who cuts, binds, and ships them. BIKINI WAXER on All Things Considered: Meet Hollywood's hottest agent -- only she isn't an agent -- she's a bikini waxer. MY FICTIONAL FRIENDS on All Things Considered: What happens when your friendships exist only in your own head? HOLLYWOOD MYTHOLOGY on All Things Considered: What does Hollywood gossip and Greek mythology have in common? ACQUIRED SITUATIONAL NARCISSISM on All Things Considered: What happens when your friendships exist only in your own head? 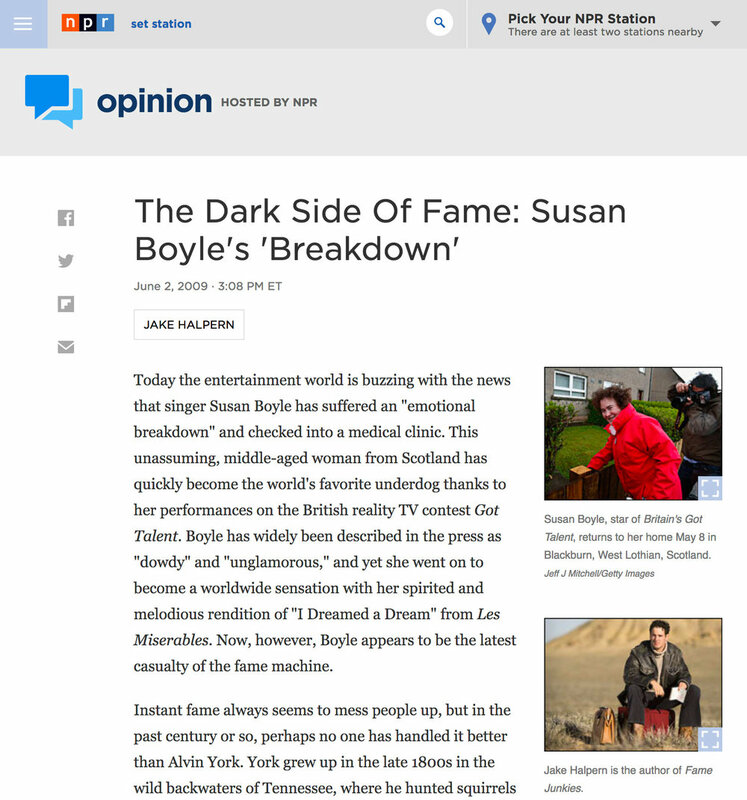 THE DARK SIDE OF FAME: Read the text of Jake's latest commentary on Susan Boyle and the dark side of fame. RULED BY ROD on All Things Considered: Marcy Braunstein claims that she is addicted to Rod Stewart. ALMOST FAMOUS on All Things Considered: Meet the Association of Celebrity Personal Assistants. OSCAR DREAMS NEVER FADE AWAY on All Things Considered: Hal Riddle is 90, but he still dreams of Oscars. AGENT FOR THE DEAD on All Things Considered: Meet a Hollywood agent who exclusively represents dead celebrities. FAME SCHOOL on All Things Considered: Major League Baseball is sending its rookies back to school to learn about the dangers of fame.